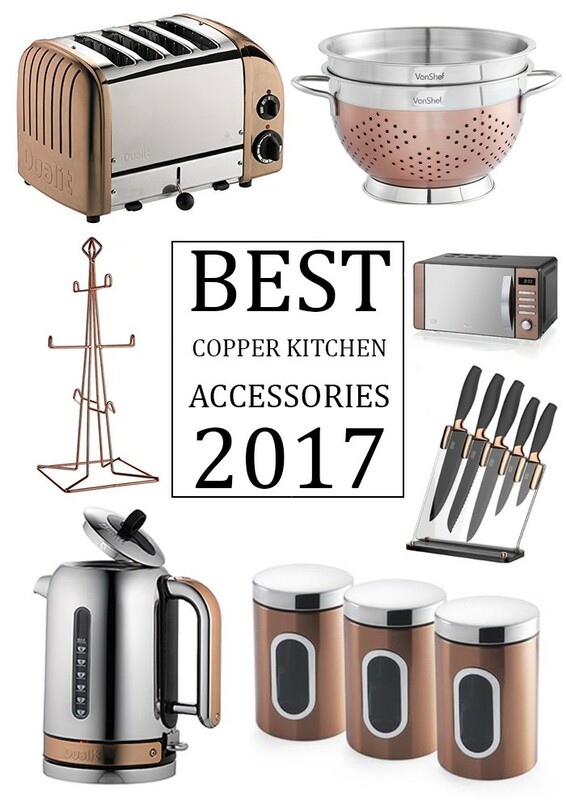 Looking for copper kitchen accessories and small appliances to add the finishing touch to your kitchen? We’ve looked in depth at the very best products on the market to bring you a list of the most stylish, robust and value for money products that are of the top most quality. To begin this year’s top copper kitchen accessories list we really did have no choice but to include a kettle that we’ve been spellbound by – Dualit’s Classic Kettle in chrome with copper trim. Okay, so it’s not totally copper in colour, but we really think that this adds to its incredible style and good looks. The two tone metallic finish is what kitchen dreams are made of! Plus this copper kettle is packed with patented innovations, is made to a superior quality and has been created with exquisite attention to detail. 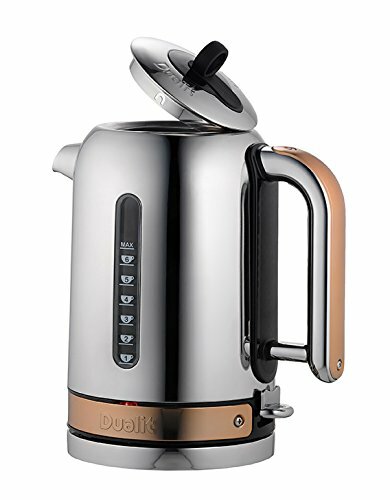 Dualit’s Classic Kettle features a ground-breaking replaceable element that lengthens the lifespan considerably and which makes this kettle worthy of its higher than average price. Its patented Whisper Boil technology has been awarded the Quiet Mark – the international mark of approval from the Noise Abatement Society. This technology considerably reduces the kettle’s boiling noise so you can still hear yourself think whilst waiting for that relaxing brew. You won’t be waiting for long either. With its super-fast 3Kw element you’ll be having that brew in next to no time. What’s not to love about this kettle? Well, we can’t fault its dual viewing windows that have been cleverly designed with two different measuring windows. 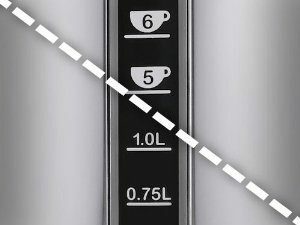 The one side is built for avid tea drinkers, featuring a cup level indicator, whilst the other side measures the water in litres – perfect for when that recipe requests a litre of boiling water. You’ll only ever need to boil the required amount, saving yourself some electricity. 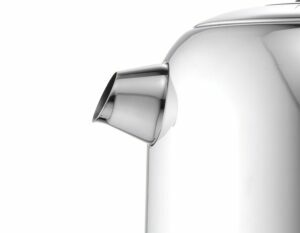 The Classic kettle’s spout has also been precision engineered to prevent water dripping onto your kettle or work surface. You’ve got to love a kettle with a non-drip spout! No mess to clean up! Other amazing features include the ergonomic silicone grip handle for safety and comfort, a durable hinged lid with heatproof ring and finger guard, and patented anti wobble feet for increased stability on work surfaces while boiling. Plus it has other common features such as integral cord storage to keep your work surface tidy, a removable, washable limescale filter to keep your drinks tasting at their best, cordless operation with a 360° swivel base and boil-dry safety cut-off. Overall, this incredible kettle is at the top of our copper kitchen accessories list for so many good reasons. 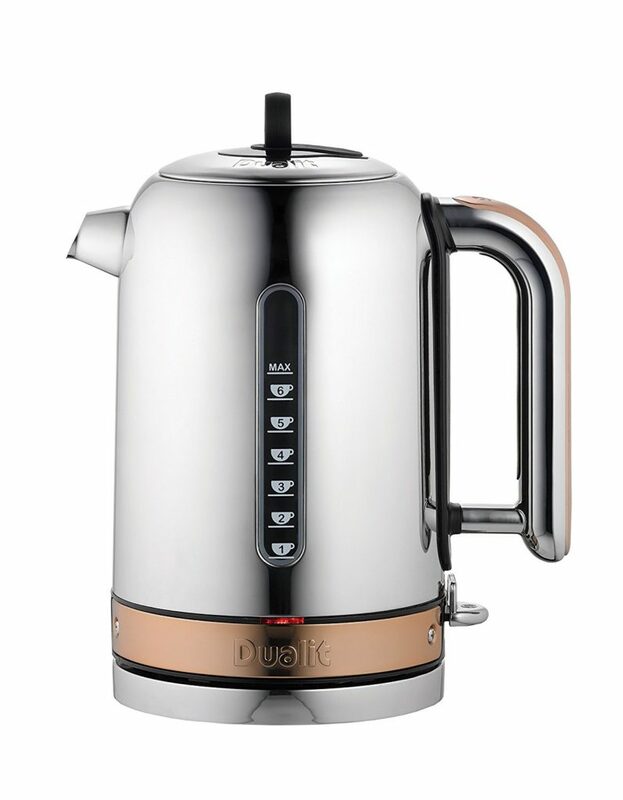 If the Dualit Classic kettle is a little out of your price range then we have this close runner up from Swan. It doesn’t have all Dualit’s fancy pants patented gizmos but it does feature a fantastic twist design that we’ve not seen replicated anywhere else before. This kettle is extremely stylish and has the usual features that make boiling water so easy in the twenty-first century. Swan’s Twist kettle can hold up to 1.6 litres, features 2.2Kw of power, has a concealed heating element (that you won’t find on the cheapest of kettles), safety conscious boil dry protection, water gauge, power lamp indicator, removable washable filter, cord storage and a 360 degree base. See? It’s still pretty darn good, aye? 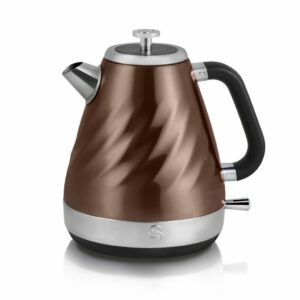 Order this kettle today at a very reasonable price and take a look at Swan’s matching Twist Toaster while you’re at it! If you’re mad about cooking then investing in a quality knife set is of utmost importance. This set not only comes with great quality knives but a beautiful and stylish clear sloping knife block to show them all off. Not only does the block make this set look sleek but it’s particularly helpful when identifying which knife to pull from the block. Each knife has a hard ceramic coated anti-bacterial blade with a soft grip handle for ultimate comfort and control. 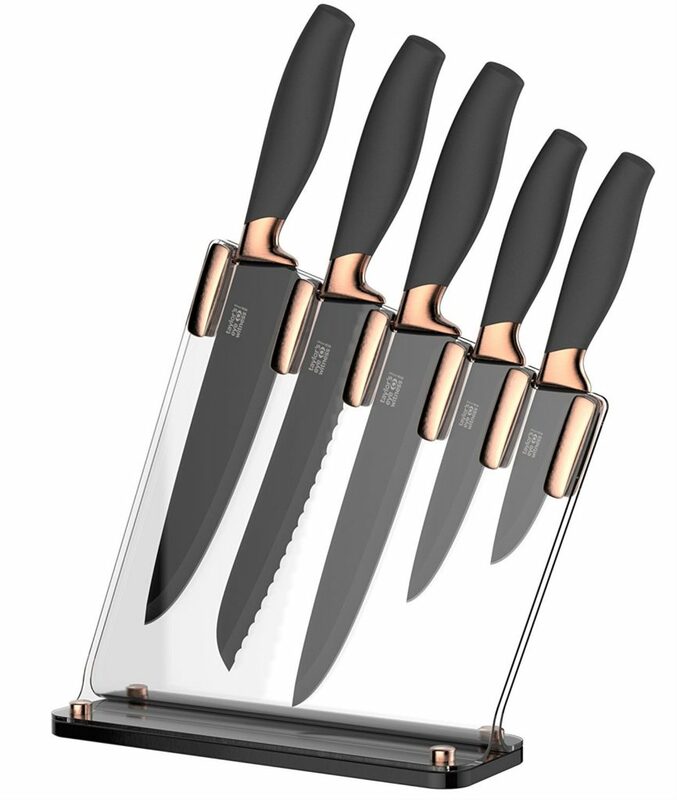 The flash of copper colour on the knives and block is a great extra touch that will elegantly add something special to any kitchen with a copper colour theme. This is one impressive mixing bowl and colander. Okay so these items are not normally something to get too excited over but we are blown away by the thought that has gone into this brilliant set. The 5 litre mixing bowl is the perfect go-to bowl for mixing, whipping, stirring and serving. Its great looks means you can happily serve up a salad on the table and not leave it to the confines of the kitchen. With its graduated cup/ quart measurements inside the bowl it makes measuring up your recipes super quick. 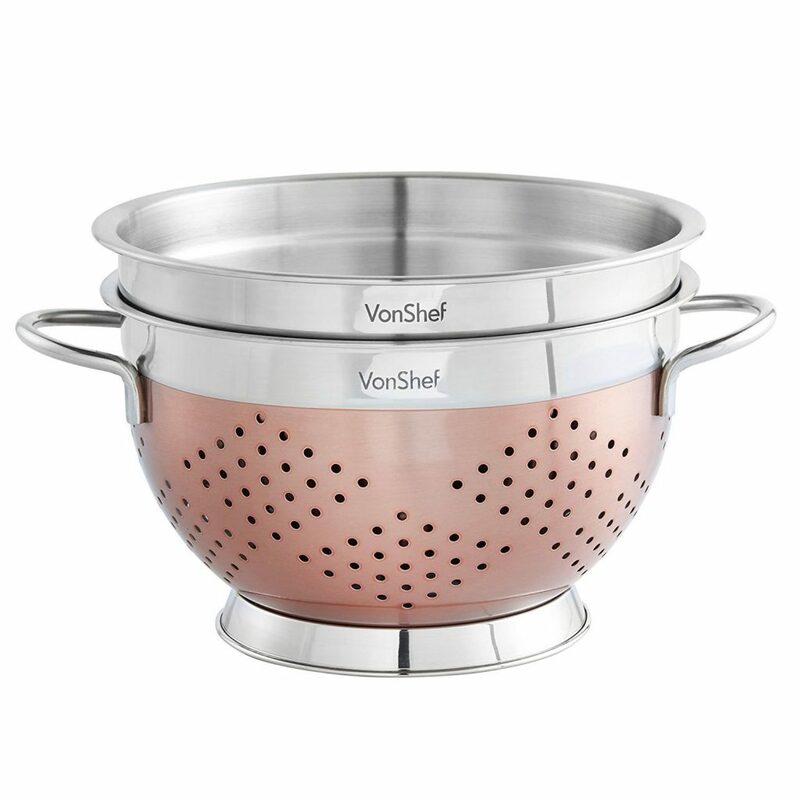 The colander does everything you’d expect including draining and rinsing all manner of foods with ease. It features large holes to drain liquids away quickly whilst ensuring contents stay where they should. Its flat base will keep it stable and the generously sized handles on either side make lifting and shaking effortless. 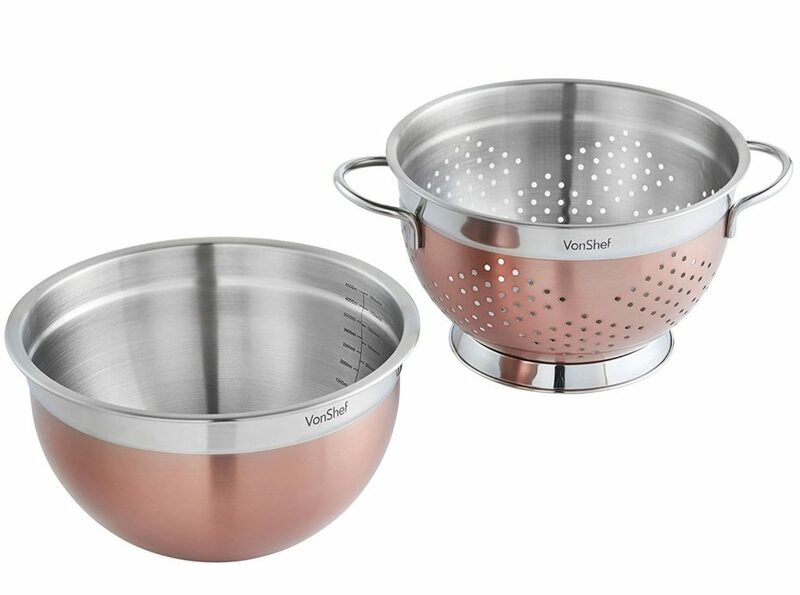 Both the mixing bowl and colander are made from food grade #201 stainless steel with a mirrored interior and a copper satin polish finish. They’re also dishwasher safe. Bonus. And the pièce de résistance? They perfectly fit inside one another for some genius space saving when stored away! 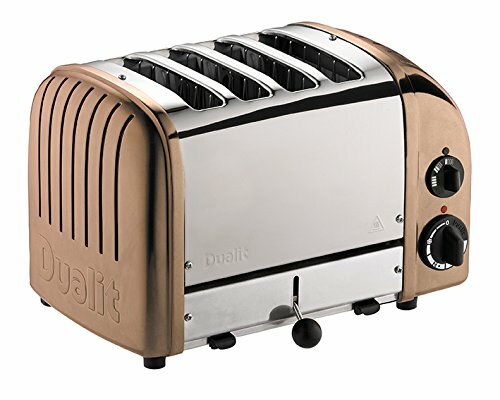 Year after year Dualit’s range of Classic Toasters are consistently one of the best designed, top quality toasters. Originally designed in 1947 it combines simplicity and sophistication, ensuring making perfect toast never looked so good. The Classic Toaster comes with a great range of features including extra wide 28mm slots to accommodate Dualit’s optional Sandwich Cage for delicious toasted sandwiches. For toasting bread are Dualit’s award winning ProHeat elements, which increase toasting efficiency and element longevity. They have a protective armour plated layer covering the filament making them virtually unbreakable. One of our favourite features of these toasters is the timer function. Ever had burnt toast because someone else changed the toaster settings? This should become a thing of the past. The Classic Toaster has a manual timer that you turn and set each time you’re ready to toast. This turns the toaster on and starts counting down to the moment it’ll stop toasting. Once the cycle is complete the toast doesn’t pop up but instead is kept warm, awaiting you to manually lift the ejector lever. Simple but genius. Every toaster also has a removable crumb tray, an adjustable rear foot and a defrost setting that gently warms frozen bread ready for toasting. You also have the option of switching between using two or four slots at a time to ensure energy-efficiency. Okay, so like the Dualit kettle this old timer of the toaster world comes with a premium price tag but let me explain to you why this classic is value for money. First of all you know you’re getting the best quality money can buy. Not many toasters can brag that they were hand built (from start to finish) in the UK. You’ll find the assembler’s name on the base plate of each toaster. No one is going to add their name to a shoddy piece of craftsmanship. The toaster has also been designed with parts that are fully repairable or replaceable ensuring your toaster will last a lifetime. By investing in a Classic toaster you’ll be contributing to less cheap kitchen appliances ending up in landfill. Overall, we have never known a better toaster. I personally own one and I’m proud to say it’s still as good as the day I bought it so very many years ago. If you’re looking for something smaller then try the Classic 2-Slot Toaster. 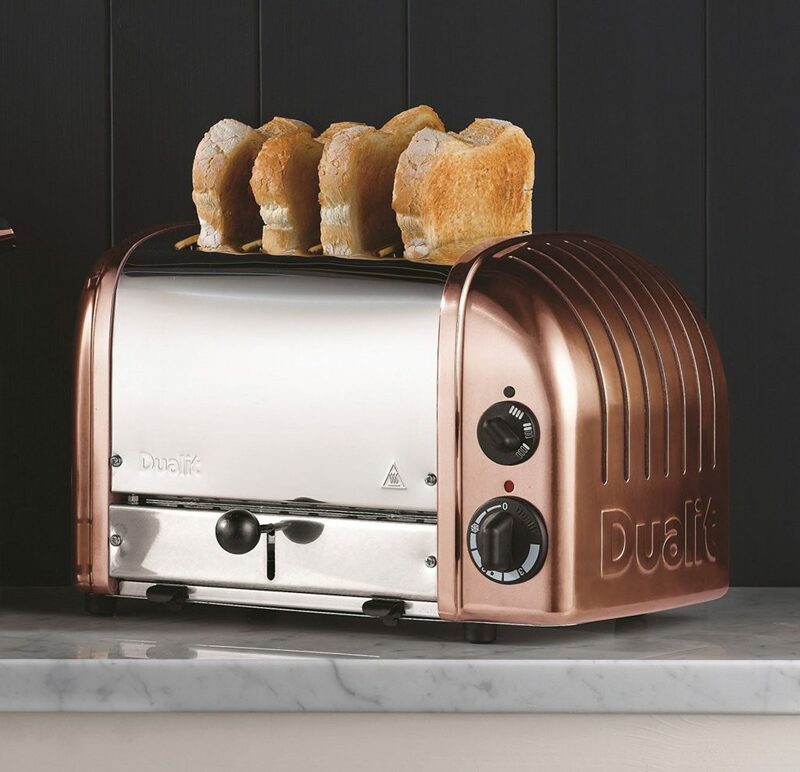 If the Swan Copper Twist Kettle caught your eye earlier then consider pairing it up with its matching toaster. It’s just as good-looking, equally great value and comes from the same reliable brand. 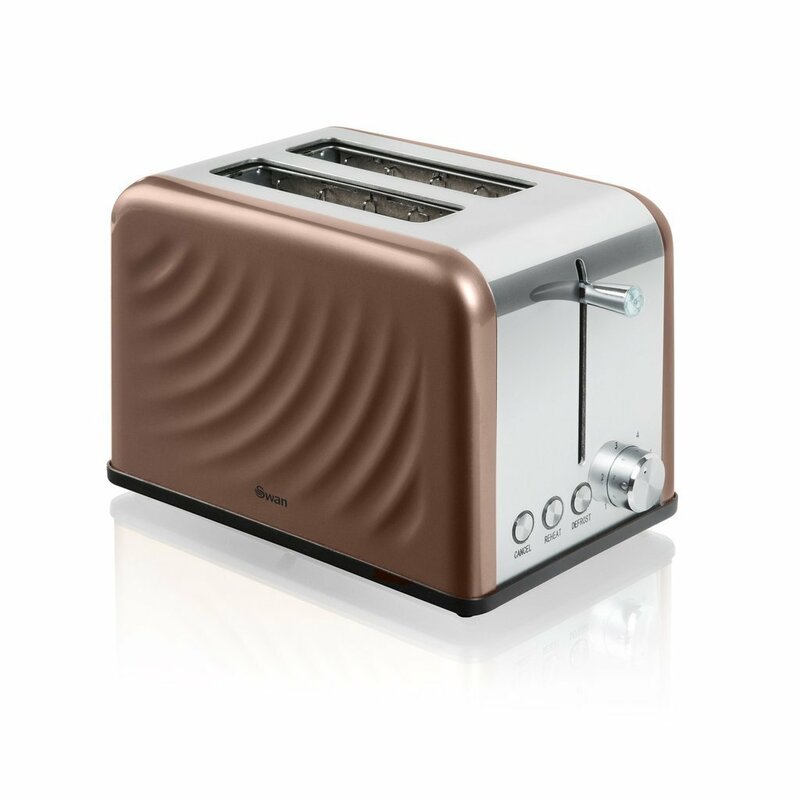 From this 800 watt copper toaster, you can expect a high-quality stainless steel body, 6 level precision browning control, slide out crumb tray, cancel, defrost and reheat buttons, a self-centering mechanism, and non-slip feet. It is what it is: a great looking and excellently priced toaster with all the standard features that you need for making toast. Combined with Swan’s Copper Twist Kettle the pair will make a winning team. 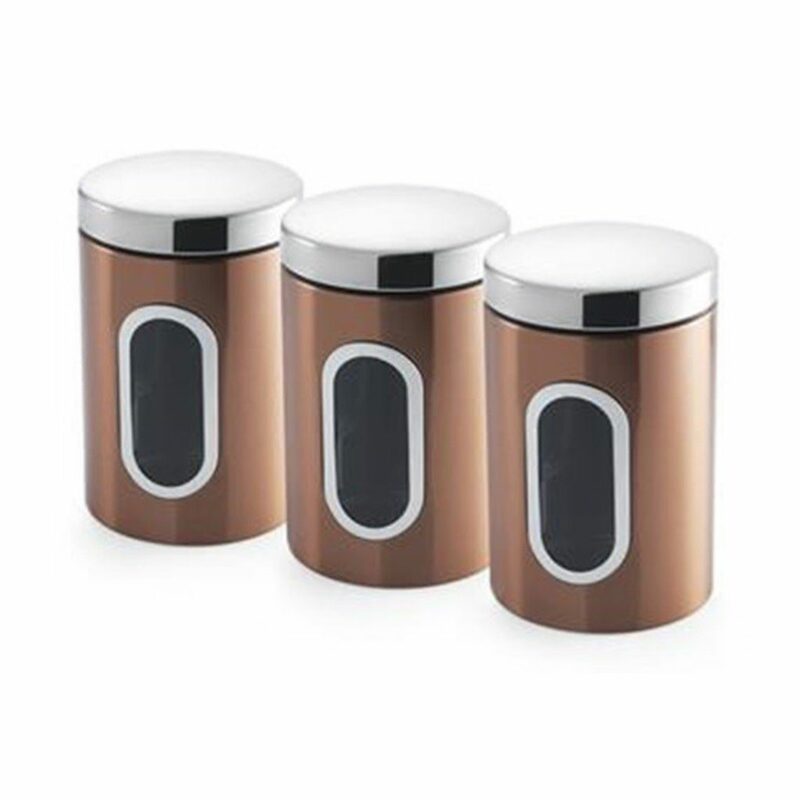 This stylish set of copper canisters by Addis can be used for all manner of food storage. Brilliant for storing tea bags, coffee, and sugar, they can also be used for other dry kitchen staples such as pasta and rice. As they are plain with no labeling such as “Sugar” this makes them a more flexible option. At a glance, you’ll still know what’s stored inside as they feature a handy little window. You also won’t have to clean these canisters too often as they’re fingerprint resistant! Guaranteed to keep your goods dry and fresh, these high-quality canisters are built to last. Wishing that your microwave coordinated with the rest of your kitchen? Well, how about this? 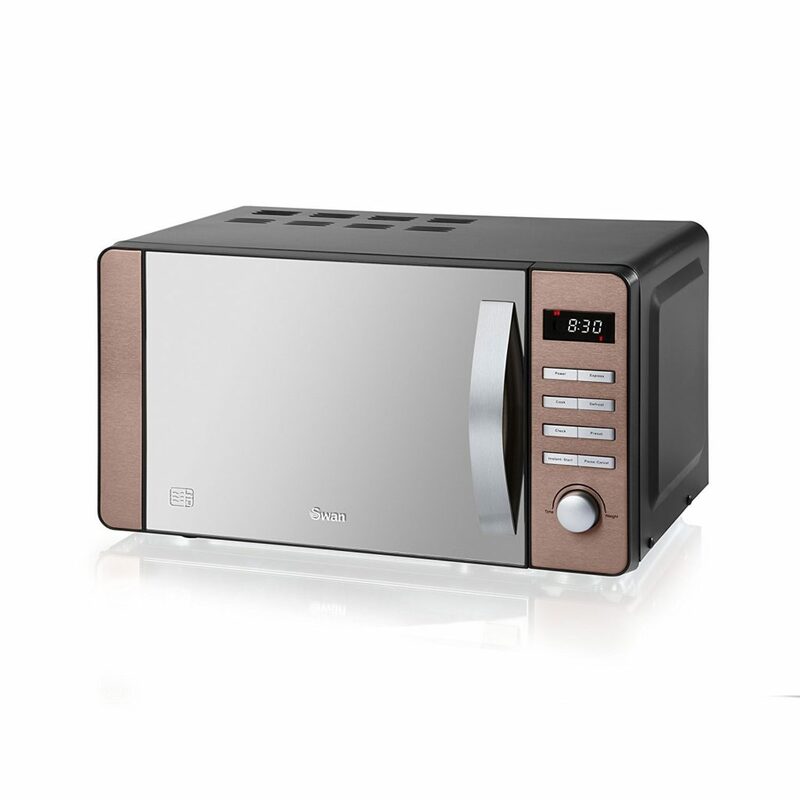 Swan has created a wonderfully stylish, modern digital microwave with a copper coloured front. It looks fantastic and the price tag looks even better. Bring your kitchen up to date with this 800W digital microwave that has been beautifully finished with a mirror door and stainless steel handle. This modern copper microwave boasts a generous 20 litre capacity along with 5 power levels and a defrost setting, ensuring that making delicious meals for the family is both quick and easy. Other great features include a 60 minute digital timer and a glass turntable for super easy cleaning. 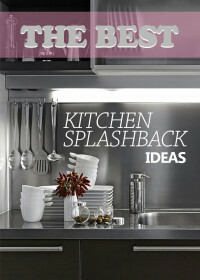 The Vertex range from Premier Housewares is one of our all-time favourite ranges of kitchen accessories. 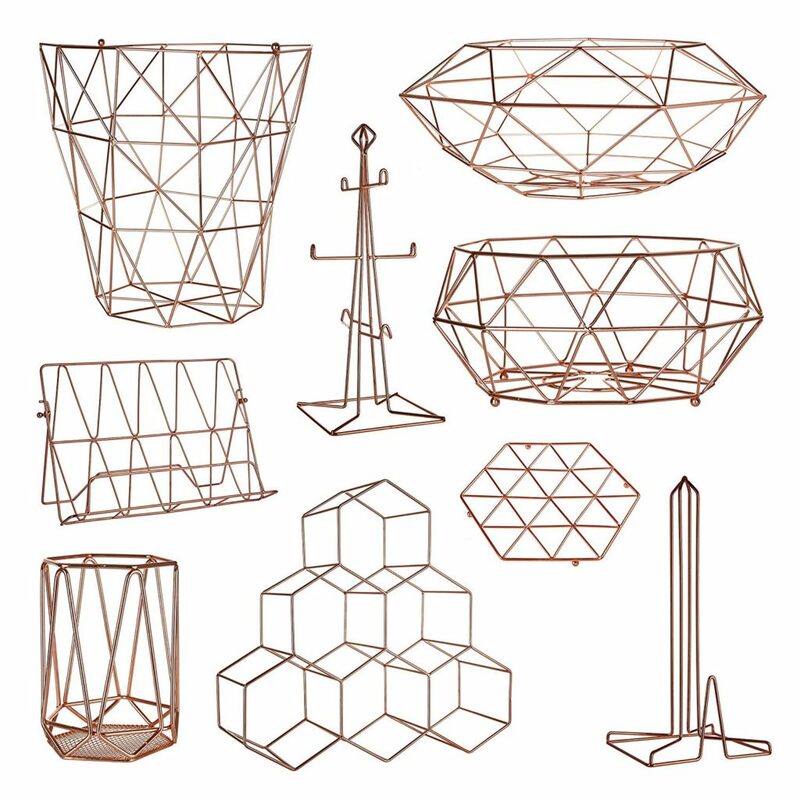 Strong and sturdy, each item is made from copper plated strong iron wire and crafted using geometrics for great looking minimalist design. You’d think that great design would come at a price, right? Wrong. The cheapest item starts at less than £6 meaning you can get the designer look for a tiny price. Items in the range include a trivet, two fruit baskets, cookbook stand, mug tree, kitchen roll holder, storage holder, utensil holder and wine rack. Pick and choose what you need to create the most incredibly chic countertops. Crazy about your Nespresso coffee machine? Well, you might just need one of these nifty coffee pod holders, specifically built by VonShef for Nespresso, Dualit and other similar coffee pod brands. They’ll keep your coffee pods neat and organised so you’ll no longer have to root through a messy pile to find what you fancy. With a 24 pod capacity there’s plenty of room for all your favourite varieties of coffee. 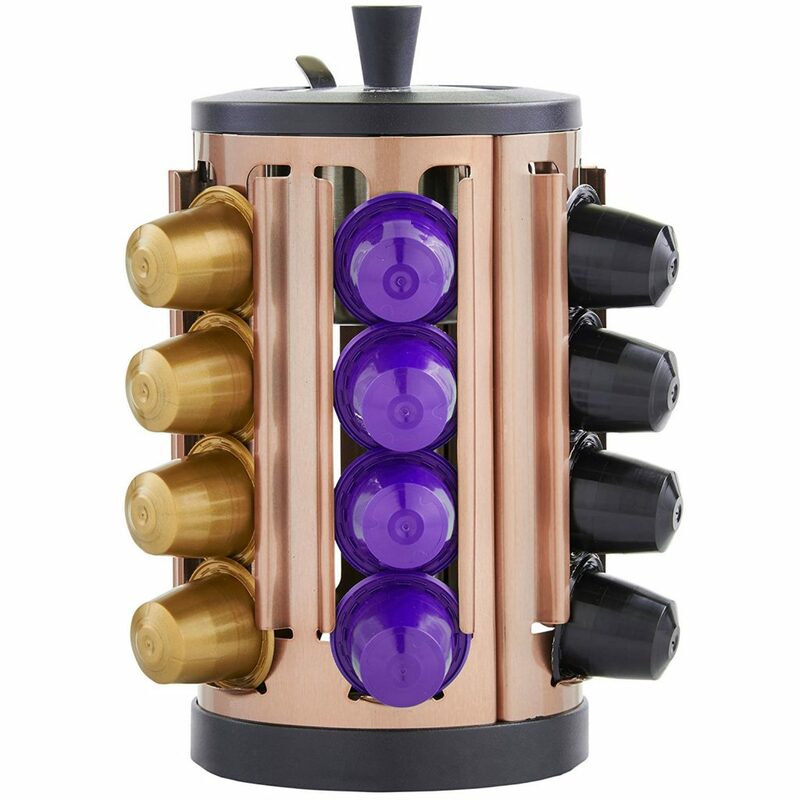 This coffee pod holder features a 360° rotating base for quick pod selection and its compact space efficient design is made from high grade stainless steel with a stunning copper finish and strong black plastic non-slip base. Its bonus feature is the built-in sugar bowl with lid and stainless steel spoon. We think this is a great product for coffee addicts and would make a superb addition to any home or office kitchen.